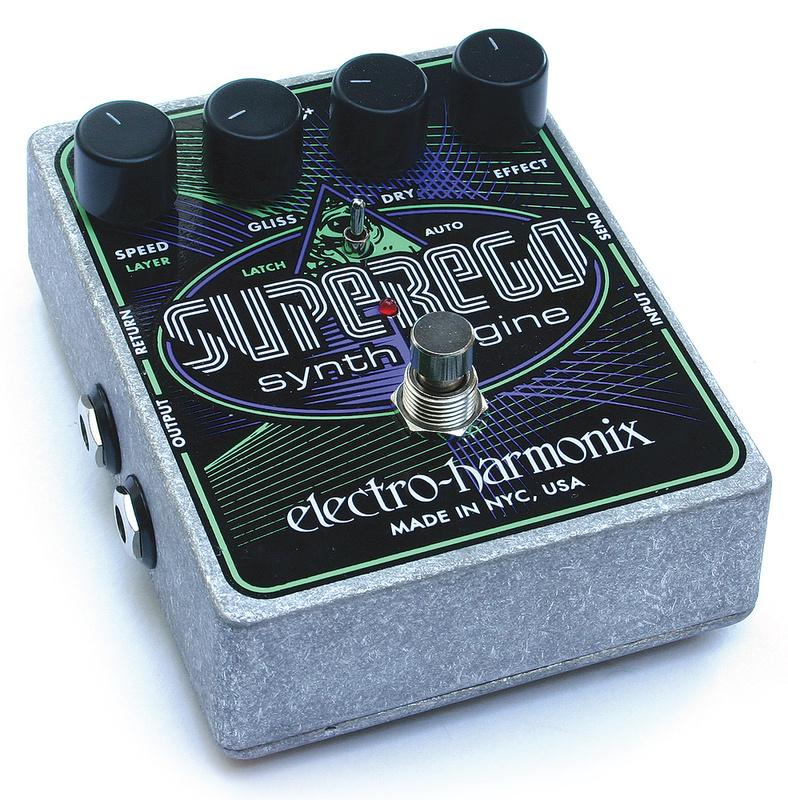 Electro-Harmonix' Superego effect is a spin-off from their Freeze pedal, which was itself derived from one of their 'infinite reverb' algorithms. Subjectively speaking, it combines the character of something synth-like with reverb to create a 'frozen sound'. It's a complex process, but essentially whatever is in the reverb when you hit 'freeze'is looped within a modified reverb algorithm. This is not to be confused with a conventional looper pedal — there are none of the sharp/granular artifacts of conventional looping. Instead, what you hear is a pad-like sustain based on the note or chord you were playing, which, once frozen, can be sustained indefinitely or allowed to fade gracefully. The Superego offers three freeze-type modes (Latch, Momentary and Auto), selected using a miniature toggle switch, plus a novel glissando or portamento effect. The four rotary controls adjust speed (Layer in Latch mode), glissando rate and the dry and effect levels. In addition to the input and output jacks, there's also an insert loop to allow you to process only the effect part of the sound using another processor of your choice. The best way to see what this box can do is simply to experiment using the three modes, and perhaps the most interesting is the Auto mode, simply because it responds to your playing. That said, there's no sensitivity control, so on a single-coil pickup instrument you do have to pick fairly hard. As with the Freeze pedal, the resulting sounds can sometimes seem a little bland and somewhat reverby. But the idea is that you add further processing via the effects loop: by patching in some delay and chorus, or perhaps a rotary speaker emulation, you can create much more impressive sounds. As for the glissando effect, that takes the pedal yet further into synth territory, but it has to be used with care if you want the results to sound musical. It's also worth noting that (and this is something I missed having on the Freeze pedal) the send jack can double as an effect-only output, allowing the normal guitar sound to be sent to its usual amp and processing chain, and the Superego effect treated separately.